The Shiva Purana is one of the eighteen Purana genre of Sanskrit texts in Hinduism, and part of the Shaivism literature corpus. It primarily centers around the Hindu god Shiva and goddess Parvati, but references and reveres all gods. The Shiva Purana asserts that it once consisted of 100,000 verses set out in twelve samhitas (books), however, the Purana adds that it was abridged by sage Vyasa before being taught to Romaharshana. The surviving manuscripts exist in many different versions and content, with one major version with seven books (traced to South India), another with six books, while the third version traced to the medieval Bengal region of the Indian subcontinent with no books but two large sections called Purva-khanda (previous section) and Uttara-khanda (later section). The two versions that include books, title some of the books same and others differently. The Shiva Purana, like other Puranas in Hindu literature, was likely a living text, which was routinely edited, recast and revised over a long period of time. The oldest manuscript of surviving texts was likely composed, estimates Klaus Klostermaier, around 10th- to 11th-century CE. Some chapters of currently surviving Shiva Purana manuscripts were likely composed after the 14th-century. The Shiva Purana contains chapters with Shiva-centered cosmology, mythology, relationship between gods, ethics, Yoga, Tirtha (pilgrimage) sites, bhakti, rivers and geography, and other topics. The text is an important source of historic information on different types and theology behind Shaivism in early 2nd-millennium CE. The oldest surviving chapters of the Shiva Purana have significant Advaita Vedanta philosophy, which is mixed in with theistic elements of bhakti. In the 19th- and 20th-century, the Vayu Purana was sometimes titled as Shiva Purana, and sometimes proposed as a part of the complete Shiva Purana. The date is unknown but the author is said to be estimated that Maharishi Agastya with his disciple Shankaracharya. Scholars such as Klostermaier as well as Hazra estimate that the oldest chapters in the surviving manuscript were likely composed around the 10- to 11th-centuries CE, which has not stood the test of carbon dating technology hence on that part we must rely on the text itself which tells when it was composed . Certain books and chapters in currently surviving Shiva Purana manuscripts were likely composed later, some after the 14th-century. The Shiva Purana, like other Puranas in Hindu literature, were routinely edited, recast and revised over the centuries. Hazra states that the Bombay manuscript published in the 19th-century is rarer, and likely the older than other versions published from eastern and southern India. and cures illness through medicines. by those who know the nature of the principles. there is no greater Atman than him. 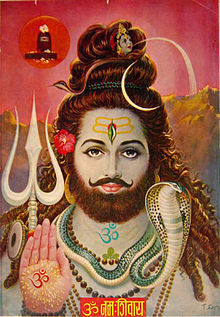 Several other Saṁhitās are also ascribed to the Śiva Purāṇa. These are the Īśāna Saṁhitā, the Īśvara Saṁhitā, the Sūrya Saṁhitā, the Tirthakṣetramāhātmya Saṁhitā and the Mānavī Saṁhitā. Haraprasad Shastri mentioned in the Notices of Sanskrit MSS IV, pp. 220–3, Nos, 298–299 about another manuscript of the Śiva Purāṇa, which is divided into two khandas (parts), the Pūrvakhaṇḍa and the Uttarakhaṇḍa. The Pūrvakhaṇḍa consists 3270 ślokas in 51 chapters written in Nagari script and the Uttarakhaṇḍa has 45 chapters written in Oriya script. It was preserved in Mahimprakash Brahmachari Matha in Puri. The Pūrvakhaṇḍa of this manuscript is the same as the Sanatkumara Saṁhitā of the Vangavasi Press edition. The Shiva Purana, in verses 6.23-6.30 of Vayaviya Samhita, states that Om (Pranava) expresses Shiva, it includes within it Brahma, Vishnu, Rudra, and Shiva, there is Purusha in everything, nothing is smaller nor bigger than Shiva-atman. The Vidyeśvara Saṁhitā, also called Vighnesa Samhita or Vidyasara Samhita, appears in both editions, is free of mythology found in some other Samhitas, and is dedicated to describing the greatness and the bhakti of Shiva, particularly through the icon of linga. This section is also notable for mentioning both Shaiva Agamas and Tantric texts, but frequently quoting from the Vedas and asserting that the text is the essence of the Vedic teaching and the Vedanta. The chapters of this shared Samhita in different versions of the Shiva Purana includes a description of India's geography and rivers from north and south India so often and evenly that Hazra states it is difficult to gauge if this part was composed in north or south India. The Jnanasamhita in one manuscript shares content with Rudrasamhita of the other manuscript, presents cosmology and mythology, and is notable for its discussion of saguna andnirguna Shiva. The text discusses goddesses and gods, dedicates parts of chapters praising Vishnu and Brahma, as well as those related to avatars such as Krishna. It asserts that one must begin with karma-yajna, thereon step by step with tapo-yajna, then self-study, then regular meditation, ultimately to jnana-yajna and yoga to achieve sayujya (intimate union) with Shiva within. The text emphasizes bhakti and yoga, rather than bookish learning of the Vedas. The Shiva Purana dedicates chapters to Shaiva-Advaita philosophy, like Linga Purana and other Shaivism-related Puranas, advocating it as a system for salvation. The text also presents the Brahman as satcitananda theme, with masculine and feminine Shiva-Shakti as a unity, and perception of plurality-discrimination as a form of nescience. Love-driven devotional (bhakti), asserts the text, leads to knowledge, and such love combined with knowledge leads to attracting saintly people and guru, and with them one attains liberation, states Shiva Purana. These ideas, states Klaus Klostermaier, are similar to those found in Devi-related Puranas and Shakti literature. ^ a b c d Dalal 2014, p. 381. ^ a b JL Shastri 1950a. ^ Kramrisch 1976, pp. 172-173, 229, 263-275, 326, 340-369. ^ a b c K P Gietz 1992, p. 323 with note 1780. ^ Rocher 1986, pp. 222-224. ^ a b c d K P Gietz 1992, p. 539 with note 2987. ^ a b Pintchman 2001, pp. 91-92 with note 4. ^ a b Arvind Sharma (2003). The Study of Hinduism. University of South Carolina Press. pp. 160–167. ISBN 978-1570034497. ^ a b Klostermaier 2007, p. 503. ^ Dalal 2014, pp. 381-382. ^ Klostermaier 2007, pp. 544-545 note 22. ^ Klaus K. Klostermaier (1984). Mythologies and Philosophies of Salvation in the Theistic Traditions of India. Wilfrid Laurier University Press. pp. 180, 263–264. ISBN 978-0-88920-158-3. Quote: Though the basic tenor of those sections of Shiva Purana is Advaitic, the theistic elements of bhakti, gurupasati and so forth are mixed with it. ^ Shastri, JL (1970). The Siva Purana. India: Motilal Banarasidass. pp. xiii. ^ a b c d Rocher 1986, p. 223. ^ JL Shastri 1950d, p. 1707. ^ a b c d Rocher 1986, pp. 222–228. ^ JL Shastri 1950d, p. 1931. ^ Rocher 1986, pp. 223-224. ^ a b Rocher 1986, pp. 225-226. ^ Rocher 1986, pp. 225-227. ^ a b c d Klaus K. Klostermaier (1984). Mythologies and Philosophies of Salvation in the Theistic Traditions of India. Wilfrid Laurier University Press. pp. 179–180, 219, 233–234. ISBN 978-0-88920-158-3. Klostermaier, Klaus (2007). A Survey of Hinduism, Third Edition. State University of New York Press. ISBN 978-0791470824. JL Shastri (1950a). "Siva Purana, Part 1". Motilal Banarsidass. JL Shastri (1950b). "Siva Purana, Part 2". Motilal Banarsidass. JL Shastri (1950c). "Siva Purana, Part 3". Motilal Banarsidass. JL Shastri (1950d). "Siva Purana, Part 4". Motilal Banarsidass.